As a student of science, I love how even something close to home can take me completely by surprise. I study sea urchin development, and yet until recently I had no idea that urchins can see. I find this fascinating because they do not have eyes, at least not as I typically think of them. I first learned of this at a talk about feet, of all things. Feet may be the organs by which urchins largely experience their world. 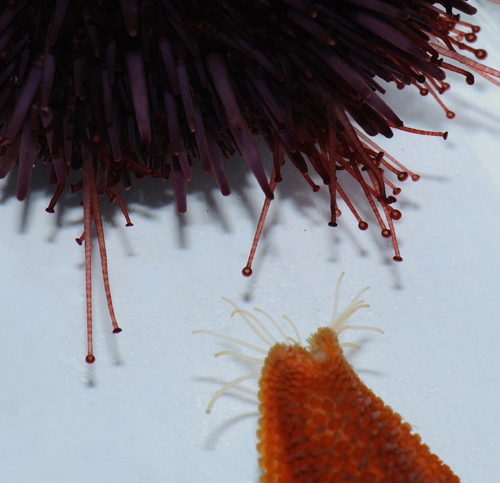 Sea urchins have hundreds of feet: thin, muscular tubes with suction cups at the ends. In the video below, you can see how their combined action allows the animal to move (slowly). The role of the tube foot goes beyond locomotion, however. 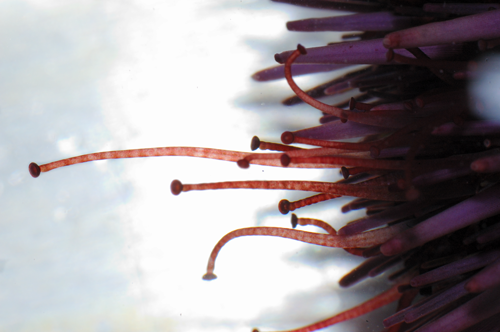 Urchins have many of the same genes that are associated with vision in other animals. But they don’t have anything that resemble eyes. Instead, these genes are expressed most in the tube feet and short appendages called pedicellariae. It’s been long recognized that sea urchins are light sensitive. Specifically, they tend to move away from it. Trickier, though, is determining how sensitive they are. Are sea urchins reacting to the presence or absence of light, or do they actually have spatial perception? Recent work by Blevins and Johnsen (2004) and Yerramilli and Johnsen (2009) suggests the latter. In these experiments, urchins would react to the presence of dark targets that looked like nice holes to crawl into in their tank. But they only recognized them if they were above a certain size, implying that their visual perception has a resolution of that certain size, and that they’re not just recognizing simple light or dark cues. So urchins can move in relation to where the dark shapes are, and they have these photoreceptor genes in their feet. But a photoreceptor alone won’t provide spatial information. A creature needs a way to screen out light coming from the sides of the photoreceptors, and only recognize light coming directly at it, so that each photoreceptor is getting a unique reading. Then it can use those readings to get a sense of the differences between the different spaces in front of each receptor. Where does sea urchins’ resolution come from? It’s possible that their spines block out all light except that which is directly in front of any given photoreceptor. When combined, all of the photoreceptors—on the tube feet, pedicellariae, and probably the shell itself—may function as a giant compound eye like that of an insect, with each receptor only seeing what’s in front of it. And if fact, it turns out that the resolution of sea urchin vision actually correlates well with the spacing between their spines. The resolution is modest, but enough to allow for some complex behavior, helping them seek shelter, locate food, or flee from predators. Sea urchins lack a central nervous system or anything resembling a brain, so I find it amazing that they are able to process spatial information. Videos and photographs taken by Adrian Reich of the Wessel lab. 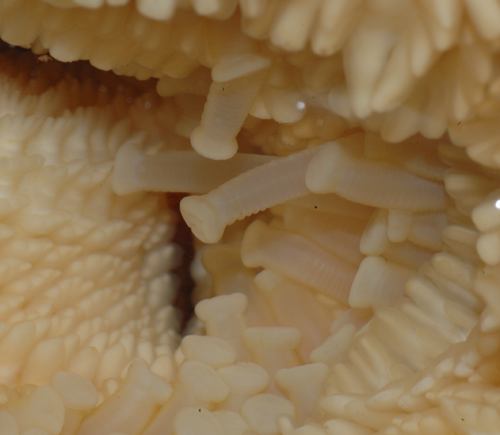 The top photo shows the wandering tube feet of the sea urchin Strongylocentrotus purpuratus. Next down is a video of S. purpuratus moving, then an image of the tube feet of S. purpuratus and its sea star relative Patria miniata. The bottom photo is a close up on P. miniata.